Members of the Clarkton School of Discovery girls’ basketball team are: Front Row (Left-Right): Karli Priest, Molly Evans, Emmee Ward, Addie Bowen, ShaNidra Richardson, Gabby Nealey. Standing (Left-Right): Maegan Burney, Cate Devane, Makayla Dixon, Coach Chris Callahan, AnnaGrey Heustess, Shy’Asis Ratliff, Emma Turbeville. 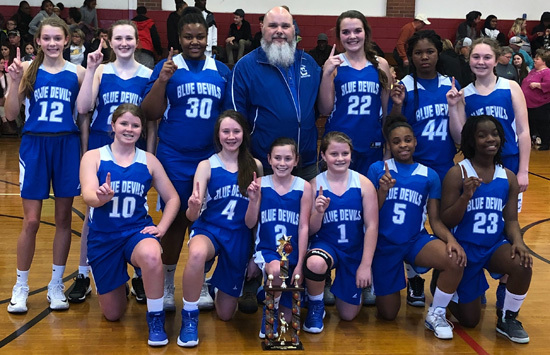 TAR HEEL – MaKayla Dixon fired in all 12 of her points during a 22-9 second-half surge that carried Clarkton School of Discovery to a 33-14 victory over Bladenboro in the Bladen County Middle School Girls Tournament Championship game. Dixon tossed in 3 baskets and 2 free throws as the Lady Blue Devils stretched an 11-5 halftime lead out to 25-10. Center AnnaGrey Heustess dropped in a basket and 2 free throws, and Karli Priest added a basket. Lainey Autry and Whitney McLean threw in baskets for the Lady Bulldogs in the third quarter, and MaKayla Wright canned a free throw. Dixon netted 2 baskets in the final period, and Maegan Burney and Priest tacked on a basket each. Autry and Rylee Chadwick scored the final Bladenboro baskets. Priest finished with 7 points, and Burney and Heustess tallied 6 points each. Autry, Chadwick and Wright led the Bladenboro scoring with 4 points each. Members of the Bladenboro Middle girls’ basketball team are Front Row (Left-Right): Marly Crabtree, Kelsey Williams, McKenzie Singletary, Megan Pait, Marlie Walters. Standing (Left-Right): Lainey Autry, Rylee Chadwick, Noria Singletary, Whitney McLean, Kaden Thurman, MaKayla Wright, Mallory Bryan, Holland Davis. Wright sank a basket and a free throw in the first quarter, and Chadwick popped in a basket to keep Bladenboro even 5-5 at the quarter break. Priest nailed a 3-point shot, and Burney pumped in a basket for Clarkton. Burney and Molly Evans connected for CSD baskets in the second period, and Heustess made 2 free throws to open up the 11-5 halftime lead. 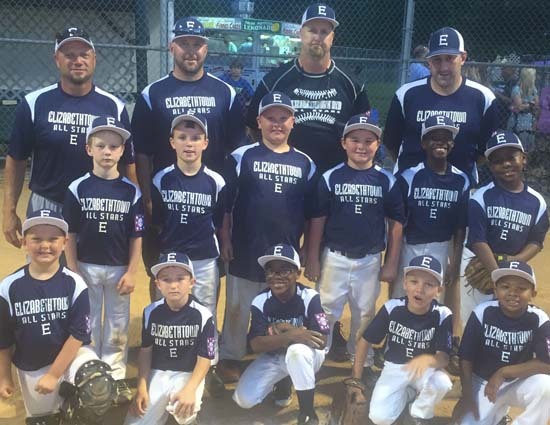 The two teams will continue regular season play against each other Tuesday at Clarkton. Coach Chris Callihan’s Lady Blue Devils improved to 6-1 on the season. Bladenboro is now 3-3. CLARKTON SCHOOL OF DISCOVERY (33) – AnnaGrey Heustess 6, Maegan Burney 6, Karli Priest 7, Shy’Asia Ratliff, Addie Bowen, Emma Turbeville, MaKayla Dixon 12, Cate Devane, Molly Evans 2, Emmee Ward, ShaNidra Richardson, Gabby Nealey. BLADENBORO (14) –Lainey Autry 4, Rylee Chadwick 4, MaKayla Wright 4, Kelsey Williams, Whitney McLean 2, McKenzie Singletary, Megan Pait, Mallory Bryan, Kaden Thurman, Holland Davis, Marly Crabtree, Marlie Walters, Noria Singletary.